A crossover of combat sports is assured to bring smiles to many. 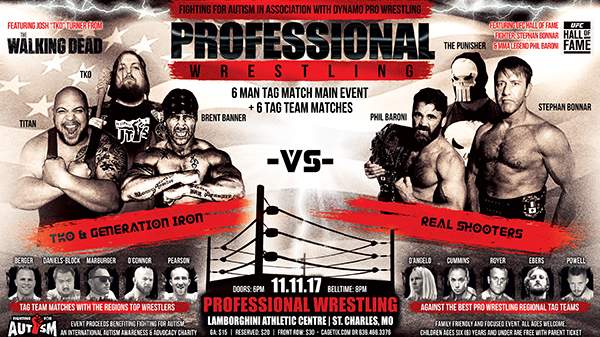 Fighting for Autism has partnered with Dynamo Pro Wrestling and many familiar names in St. Louis mixed martial arts for a fundraiser and awareness professional wrestling show set for Saturday, November 11th at the Lamborghini Athletic Centre in St. Charles. The main event has MMA legends and a television star all part of a six-man tag match. UFC Hall of Famer Stephan Bonnar and UFC and Pride FC veteran Phil Baroni partner with adaptive MMA trailblazer Garrett "The Punisher" Holeve to face off against a trio that includes the hard hitting Georgia-based tag team Generation Iron (Titan and Brent Banner) partnered with Josh "TKO" Turner, a cast member of AMC's hit series, The Walking Dead. The co-main event features two familiar names in a tag team match that is sure to get the St. Louis MMA community choosing sides as Gateway Fighting Series promoter Jared Daniels-Block pairs with one of Dynamo Pro's standout wrestlers to take on UFC and Bodog Fights veteran, and longtime MMA coach Steve Berger paired with another of the promotion's contenders. A feature Veteran's Day Tag Match will highlight the show featuring pro fighter, veteran and currently serving SSG in the Missouri National Guard, Jason Powell. Powell is on a mission to raise awareness about veterans issues at the show. In the evening's only women's match two Invicta standouts team up as Kelly D'Angelo tag teams alongside "Smashley" Ashley Cummins, as they both make their pro wrestling debut against a tough and experienced female tag team off the Dynamo Pro Wrestling roster. Popular local fighter "Johnny Irish" Dan O'Connor will be joined by a Dynamo Pro Wrestler to square off with Academy of Courage's Brandon Pearson and his Dynamo Pro partner. The HeadNod Squad's Adam Marburger will partner up with one of the region's best wrestlers to take on one of Dynamo's most destructive tag teams. Bellator vet and Academy of Courage coach Kain Royer will make his return to competition in a gym-vs-gym match against the Wolves Den's Andrew "Mop" Ebers, each will have talent from the Dynamo Pro roster as a tag-team partner. A total of seven matches will provide non-stop action for the audience, all while supporting Autism Awareness and Acceptance, and according to Fighting for Autism's Brian Higginbotham, raising funds for Fighting for Autism to open a new Autism Center in St. Charles County to provide services, support and resources to the local and regional autism community. The event is a family friendly event and open to all ages. Based out of St Louis, Dynamo Pro Wrestling hosts events regularly and features a wide variety of wrestling styles, from exciting high flying to technical mat wrestling to strong style in your face action. Dynamo Pro Wrestling also offers training to individuals that are interested in becoming a professional wrestler. For more information on Dynamo Pro Wrestling visit their Facebook Page. Tickets start at only $15 with $20 reserved seating and $30 ring side seats. 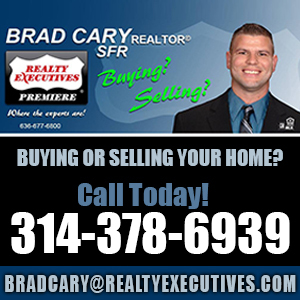 For tickets, or if interested in sponsoring the event, call Brian Higginbotham at 636-466-3376.